Figure A80. Sisimut anomaly, interpreted as the Sisimut slab, with (horizontal) [vertical] cross sections through (A)[D] the UUP07 p-wave) and (B)[D] the combined SL2013 and S40RTS s-wave models at 1450 km; C) the location of the modern geological record that we interpret to have formed during the subduction of the slab. 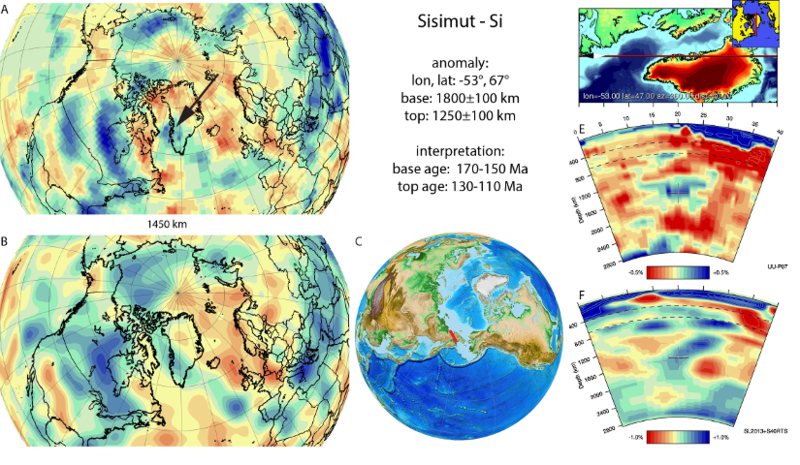 The Sisimut anomaly (Figure A80) is located below northernmost North America and Greenland within the mid-mantle. It is NW-SE trending and does not have a neighbouring slab in close vicinity. Van der Meer et al. (2012) suggested that the slab may result from paleo-Arctic subduction and loosely inferred the anomaly we now define as Sisimut slab to be of Early Cretaceous age. It was recently studied in detail by Shephard et al. (2016) who named it the Greenland anomaly. Within the region of the Sisimut slab, Nokleberg et al., 2000) documented southward subduction of Angayucham and Anyui lithosphere below the continental-margin Nutesyn arc. This arc is Late Jurassic to Early Cretaceous in age (Nokleberg et al., 2000; Parfenov et al., 2009). In the plate motion model of Shephard et al. (2013), these different elements were integrated and they concluded that subduction below the Koyukuk and Nutesyn arcs was active between 160-120 Ma, which we adopt for ages for the top and bottom of the slab, in line with Shephard et al. (2016).